After an abysmal June garden report, I’m back to check in with you all and show you how the gardens did last month. I promise, I’ll try not to be quite as depressing. Well it would seem things are coming along, I suppose. At least visually and Green-Growth-Wise. My problem is, I’ve got to figure out what to grow so that we’re eating from the garden in June and most of July… I remember thinking that a couple years ago too. Surely there is something that ought to be producing then!? •As it stands right now, we’re just beginning to get a trickle of summer squash. (I’m sure the rest of you are up to your eyeballs in it. It might be hard to be grateful for the influx, but do it for my sake!) I’m nervous that we won’t get too much beyond the next few weeks what with the cucumber beetles doing what they do best and destroying them one.plant.at.a.time. There was one week where I went out and there was a new plant wilted and dead every morning between the squash and the cucumbers! The rhubarb spray seemed to slow the destruction down for a short while, but I’ve been less than consistent with applications since there is only a short window in the day I like to use it and that same window happens to be the Bedtime For the Kids window with all of the chaos and madness that it brings. I expect the cucumbers to be long gone before the next garden update. Thanks you striped little monsters. Nope, No. Forget all that. I wait for homegrown tomatoes to ripen in the summer before getting a taste of the best flavor summer has to offer. That, my friend, is what really tests a person’s patience! The kids are simply behaving just like me except I’m old enough to know better and oughta be able to practice more self-control. •I’m doing a few new things over in the dead zones in the garden…. Did you notice? First, see the black tarped areas? I read in The Market Gardener that they use the UV black fabric to kill down weeds and seeds a month or so before planting. It was an investment I would have balked at in the past, but one I hope will be worth it. So far it has kept me from doing a whole lot of weeding. And hopefully when I peek under prior to transplanting the fall garden, I’ll see just how nicely the spent plants and old weeds decomposed and contributed to the organic matter in the garden. Also, I’m trying a little test where I’m starting some of the fall garden in seed flats and then transplanting them later. I have the caterpillar tunnel, open ended on each side, with beets, kale, cabbage, and broccoli growing. So far they seem to be doing well and I’m thinking that by not starting them indoors this time, I’ll be able to avoid the sensitivity issues that seedlings have during hardening off. The only issue I’ve had with this situation so far is that we had a raging thunderstorm one afternoon and a wind gust (that also took down about half the corn & tomatoes) picked the tunnel right up, flipped it sideways, and killed a pepper plant. Since I didn’t notice until the next morning, the seed trays were soggy from all the accompanying rain. Heading over to the Pantry Garden, we’re dealing with something occasionally strolling by and chomping down the onions and carrots. Meat chickens escaping their enclosure and taking out a bunch of the cabbage. Not being able to find any brussels sprouts seedlings I planted, except for maybe four? Or are those cabbage? Well it’s some sort of cabbagy/broccoli looking plant growing at any rate. We finally have some potatoes in the ground, growing well and looking good. But altogether, it’s still just a big waiting game. Except for the garlic. I was thankful to have a beautiful gathering of garlic… maybe not the 11 pounds I had hoped for. But since a third of them were accidentally burned to the ground and managed to survive, I’m glad for what we do have! Honestly, I spend little time in this garden. I don’t know if it’s because it’s not as pretty or if it’s that my husband declared his hatred of no-till gardening methods and pretty beds and the hassle of hay mulch during an argument one fine spring day and declared the Pantry Garden as his own to compare to what I do in the Kitchen Garden. See which does best. Yeah. I’m pretty sure I must have a competitive bone or two and though I’ll occasionally have pity and help him with hand pulling some weeds, for the most part I’m going to let him do it his own way. He has since back peddled on the whole hay mulch thing now that he sees how much work it does save in the end and that the soil underneath isn’t cracked like a desert. And he has come to appreciate the beauty in the Kitchen Garden (where things are actually growing). But the no-tilling thing I think is going to take another spring or two to convince him. I’m hoping that by then I might have matured enough that I won’t gloat too much. 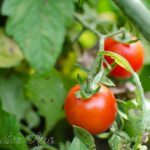 Grow plants that are productive through June and the first 2 weeks of July!! Looks like a beautiful garden! I know gardens are a lot of work though, we’re still trying to dig ours out of the weed overgrowth that threatened to turn it back into a part of the yard. Almost there! My squash and zucchini plants are long gone now, maybe you could plant them earlier? June and July are when I get my bumper crop. The bugs won’t get them as quickly early on either. 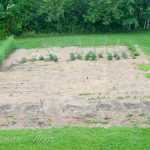 Quinn, thanks for sharing your garden update! 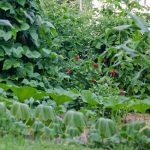 I’m usually a lurking guest here on your blog, but garden talk is a favorite subject and I cannot resists chiming into this conversation. In my location (Central WI), June and July offer ideal weather for cooler crops like kale, peas, misc. greens, radishes, etc. 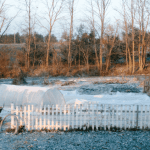 This year we tried row covers over kale and cabbage – my attempt at keeping the cabbage worms at bay – and incidentally, the covers were fantastic mini-greenhouses. My cabbage got a huge boost by this and I think the first red cabbage was harvested shortly after the 4th of July. These were plants I started indoors sometime in April and set into the garden around the end of May/beginning of June. Our potatoes looked lovely during those months (probably because the potato bugs had not really set in yet) and you could probably dig new potatoes in early-mid July as well. On weed control…we are slowly transitioning an old farmstead who’s pasture land has been overrun by reed canary grass. This includes the garden area. One solution we have tried with some success is to get plastic silage cover scraps discarded from local farmers. The farmers are more than happy to give us scraps for free, they are black on one side & white on the other, and withstand UV rays very well. We’ve used our current scraps for 2 seasons and they are still sturdy. If you have a source and are OK with pieces that are not “perfect”, these are a great cost-free option. Keep the updates coming and good luck with the rest of the season! Thanks for all of this great information Jennifer! Filing it away for next years garden for sure!! You give me hope that we can do it! I’m in western South Dakota. We have managed to dodge a few hailstorms this year. That is always my worst nightmare. The one we had early in the season didn’t do too much damage. Potato beetles ate all the potatoes then started on the peppers. Even picked a few off the tomatoes. Still waiting for tomatoes to ripen. The plants are huge. I use the no till method and have been trying to keep the ground covered with old hay. The squash are going wild except the zucchini which are weirdly quiet. The squash bugs are coming on though, that is a constant battle. Beans have done well. Beets did great. Chickens have done some garden damage but as long as I can keep them out of the tomatoes and squash I can live with that. I use a lot of cardboard in the garden to kill big patches of weeds or keep areas clear. I enjoy your garden stories because they are real. Love it Debbie! Sounds like a real mixed bag of good & bad- which is all I think you can hope for 🙂 And just be thankful that it’s not ALL bad, right? So glad those hailstorms missed you. You can at least try to fight the bugs, but you’re at the mercy of the weather. I’m in upstate NY…not too different from your spring/summer climate, maybe a slightly shorter growing season. Swiss chard has been my most reliable late June/early july crop. And then it keeps up producing most of the summer (and can even overwinter). Lettuces produce well for us in June and early July as well (then typically bolt by late July). I also focus on preserving fruits during June and July (strawberries/blueberries/wild raspberries). So those are more gathering months for us, while we tend to the young plants in the garden, and also enjoy the fresh greens to hold us over until the rest of the veggies are ready. Thank you for all the great ideas! I tried a few of those this year, but they never really took off (swiss chard is still not quite of a harvestable size!) Have you ever tried overwintering peas? I’d like to see if that would help me get a jumpstart for next spring, but never heard of it being done outside of a seed packet once. Hi. Please appreciate your rain! We live in Northern California and are experiencing a drought! Although this kept the weeds down, and allowed me to plant a winter garden for the first time, we would love some of your rain!! My biggest problem &frustration has been the squash bugs!! 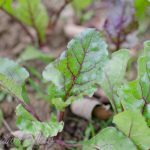 My winter garden was planted in late January & produced tons of beautiful kale (2 types), peas, broccoli, chard, cabbage, brussel sprouts & various lettuces. We enjoyed the broccoli until mid May & the lettuce bolted in early June. However, the bugs attacked my pumpkins, zucchini, melons, cucumber, and butternut plants in mid June. My beautiful kale &chard were then attacked. Sadly, all methods of eliminating the pests have not been 100% successful. I plan to pull/till our entire garden (which also includes beautiful peppers of all kinds, a variety of tomatoes, basil, Japanese eggplants, and chili peppers in September. I hope to plant a nee batch of greens in a different area of our garden in late September. We’re still experiencing 90+ degree days here. Nevertheless, no matter how little or great our harvest, it is worth it!! Thanks for sharing! I love my gathering apron which I got from your website. Keep up the great work! !! Thankfully, the well-growing pasture grass is keeping me thankful for the rain! What a difference from last year! I’m so sorry to hear you’re having to struggle through a drought- that sure is rough! We had one a few years ago and I knew then I couldn’t complain because I couldn’t remember another severe drought since I was 8 years old.